2010 began with disappointment over the Copenhagen climate change summit, only to end on a note of guarded optimism over the success -- or lack of failure -- in Cancun. Meanwhile, changing climate patterns have opened up new areas to mineral extraction, while exacerbating existing tensions over water. All of these developments take place against the backdrop of increasing global competition for mineral resources and rare earth elements. 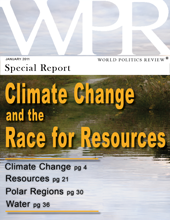 In this special report, World Politics Review considers climate change and resource competition through articles published in 2010.